Data and information on all things World War 2. This armor-piercing tracer round is fired from 76mm divisional guns M1902/30, M1936 (F-22), M1939 (USV), M1942 (ZIS-3); tank guns M1939/39 (L-11), M1939 (F-32), M1940 (F-34), M1941 (ZIS-5); and self-propelled gun M1942/43 (SAU-76). All of these weapons except the M1942 and M1942/43 are obsolete in the Soviet Army. It is primarily used in direct fire against tanks, armored trains, and armored or reinforced concrete structures. No fuze is used with the BR-350SP projectile, which is a solid shot and has no explosive filler. A tracer element is threaded into the base of the projectile. 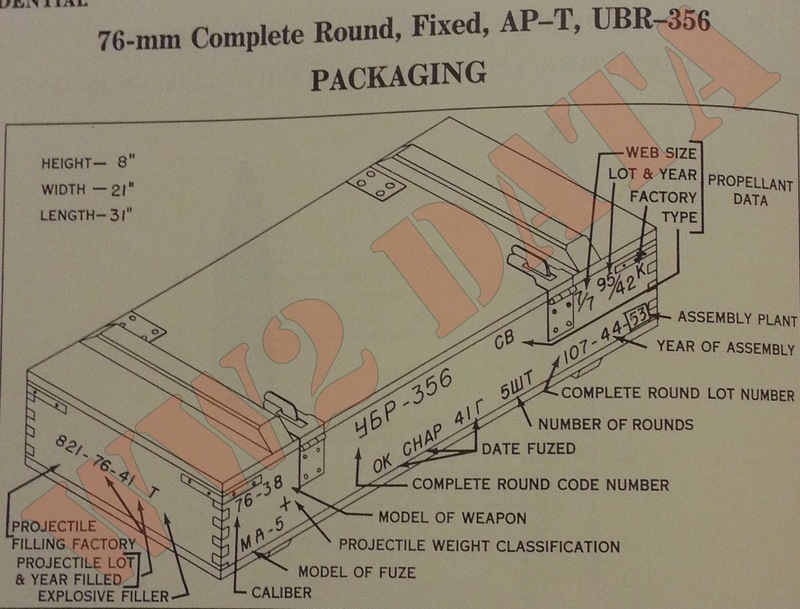 This ammunition is packed in a 5-round wooden box, which weighs about 58kg (128 lbs) when packed. It may also be found in 6- or 8-round wooden boxes, weighing respectively about 70kg (154 lbs) and 94kg (207 lbs). This Soviet armor-piercing tracer round is fired from the 76mm mountain gun (howitzer) M1938. It is used against such targets as tanks, armored trains, and armored or reinforced concrete structures. Its projectile contains a small base cavity filled with high explosive. 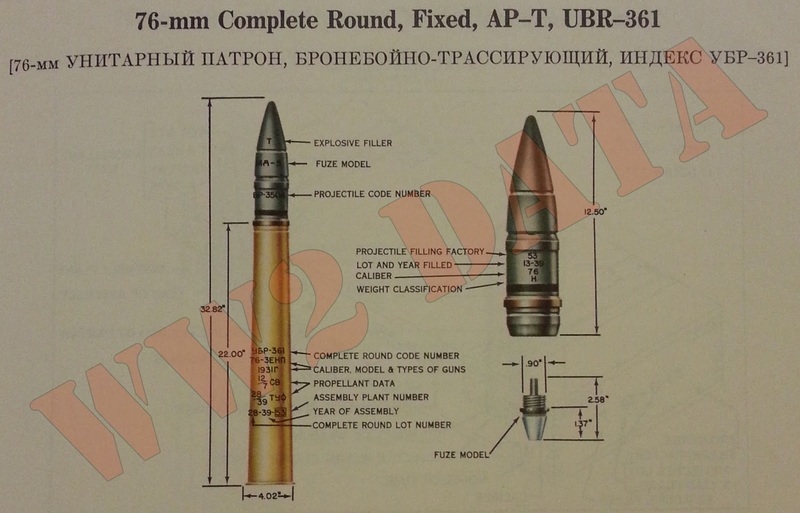 The MD-5 and MD-7 fuzes are used with the BR-350A projectile in this round. A black color band forward of the rotating band may or may not be found. The significance of the black band is not known. 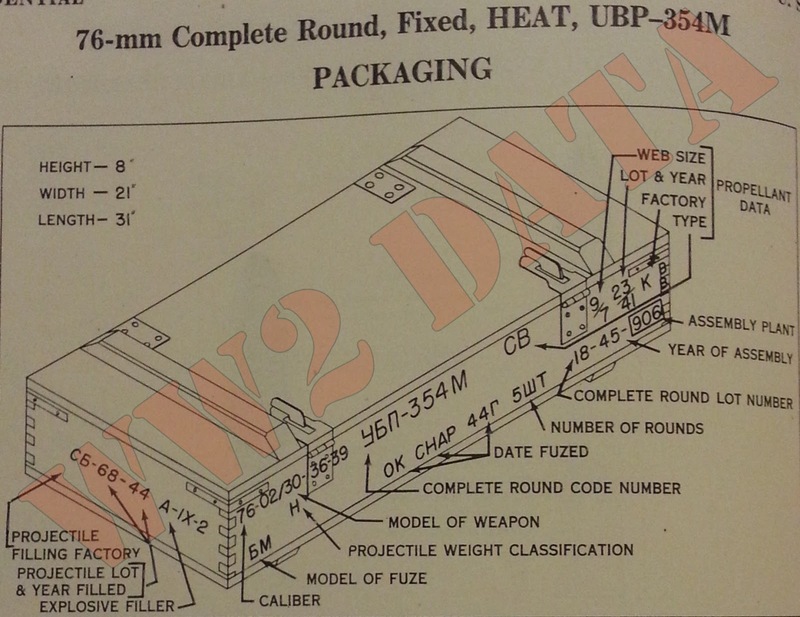 This ammunition is packed in wooden packing boxes, each box containing five rounds. The gross weight of the packed box is about 60kg (132 lbs). This armor-piercing tracer round is fired from the now obsolete 76mm anti-aircraft guns M1931, M1931/33, and M1938. It is used against such ground targets as tanks, armored trains, and armored or reinforced concrete structures. Its projectile contains a small base cavity filled with high-explosive. 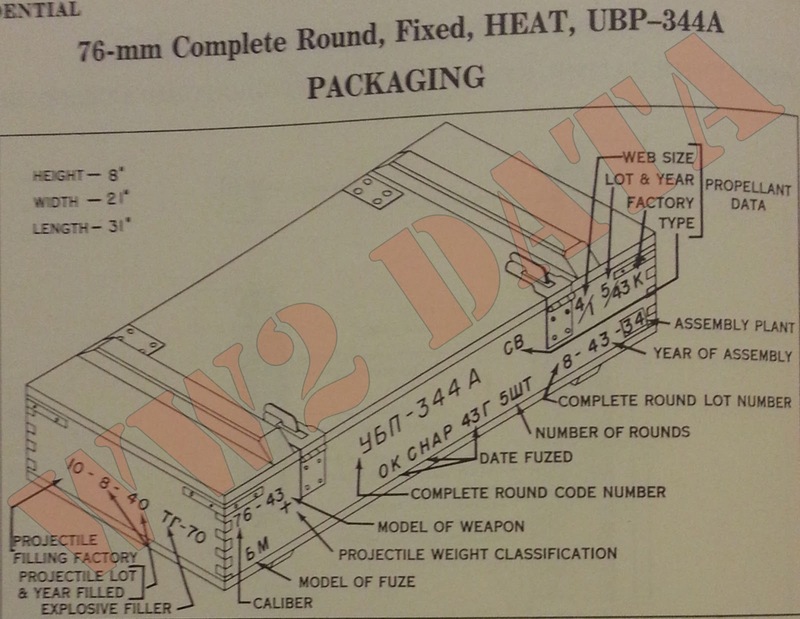 The MD-5 and MD-7 fuzes are used with the BR-350A projectile in this round. A black band forward of the rotating band may or may not be found. The significance of the black band is not known. 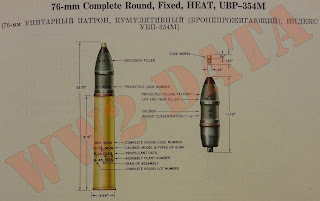 A BR-361 projectile, equipped with an MD-5 or MD-7 fuze, may be used instead of the BR-350A in the illustrated round. 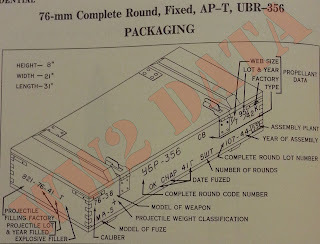 This ammunition is usually packed in a four-round wooden box, although it may be found in the regular five-, six-, or eight-round boxes accommodating other 76mm ammunition. Note. The dimensions on the above drawing have not been verified. This high-explosive anti-tank round is fired only from the now obsolete 76 regimental gun (howitzer) M1943. 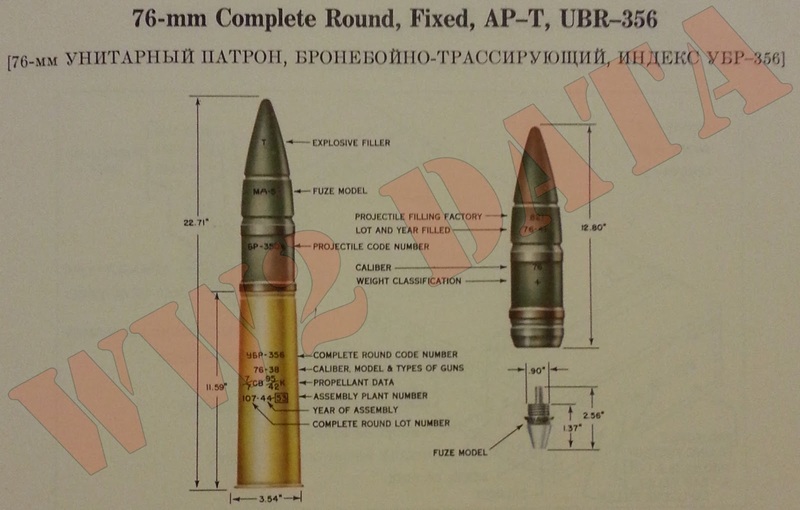 It is not interchangeable with standard ammunition used in other 76.2mm weapons. It is used chiefly against tanks, but also can be used against various kinds of fortifications. 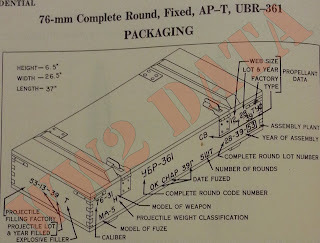 The BM fuze is used with the BP-353A projectile in this round. The tracer element in the projectile is removable. Note. 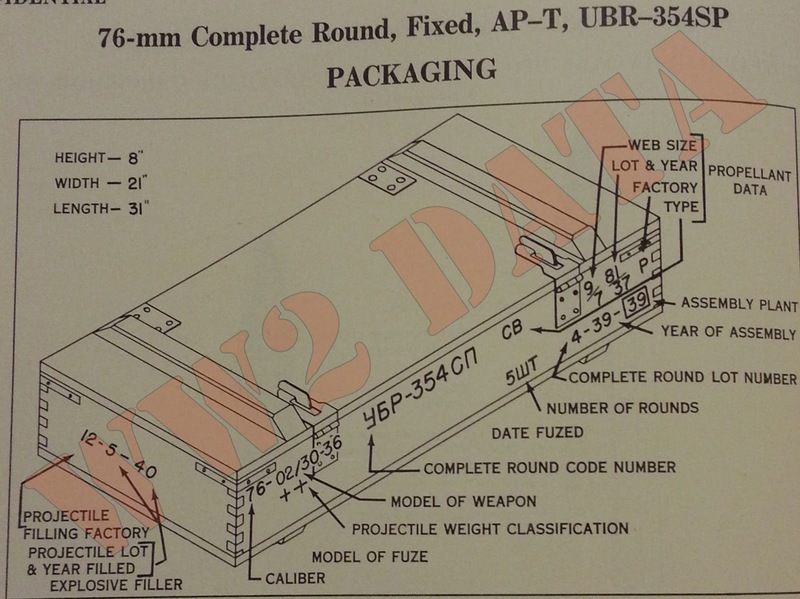 The dimensions and markings of the cartridge case in the above illustration have not been verified. 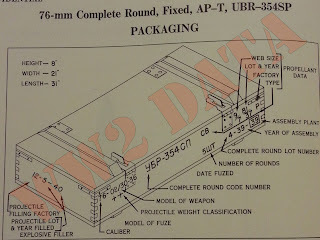 The illustrated wooden box has a capacity of five rounds. 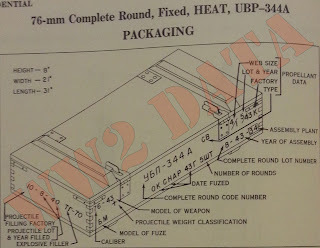 This ammunition is also found in wooden six- or eight-round packing boxes. 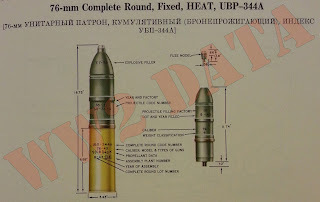 This high-explosive anti-tank round is fired from 76mm divisional guns M1902/30, M1936 (F-22), M1939 (USV), M1942 (ZIS-3); tank guns M1939/39 (L-11), M1939 (F-32), M1940 (F-34), M1941 (ZIS-5); and self-propelled gun M1942/43 (SAU-76). All of these weapons except the M1942 and M1942/43 are obsolete in the Soviet Army. 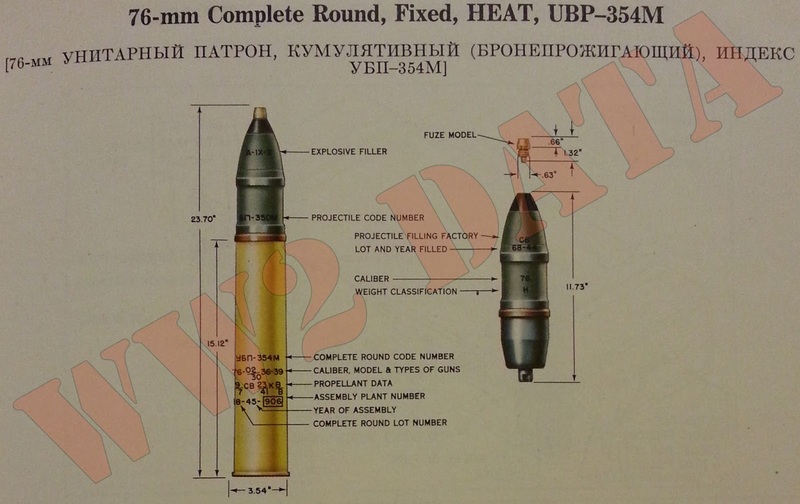 The BM fuze is used with the BP-350M projectile in this round. A tracer assembly is threaded into the base of the shell. This is unusual in a point-fuzed HEAT projectile. 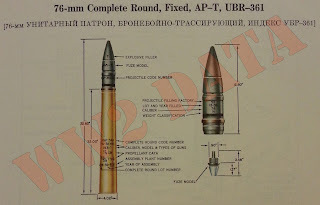 The illustrated round carries the nomenclature of a British propellant, and this marking is believed to indicate that propellant supplied under Lend-Lease has been used. 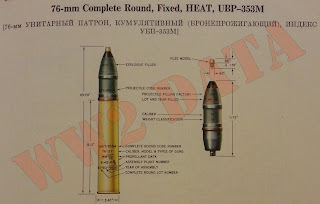 The complete round UBP-353A, with a BP-353A projectile using the BM fuze, is a variant of the illustrated round. 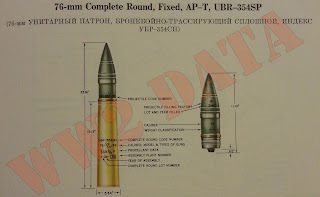 The BP-353A projectile has a shorter, more rounded ogive than the BP-350M. 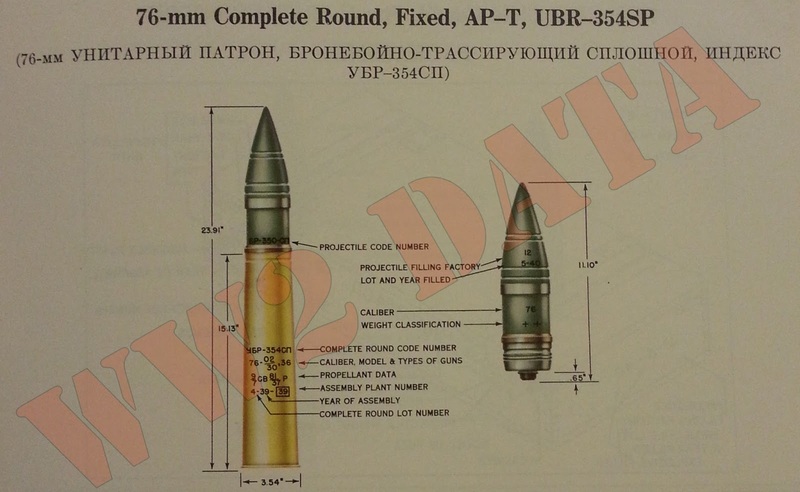 The UBP-353A complete round, however, is basically the same as the UBP-353M and is fired from the same weapons. Note. 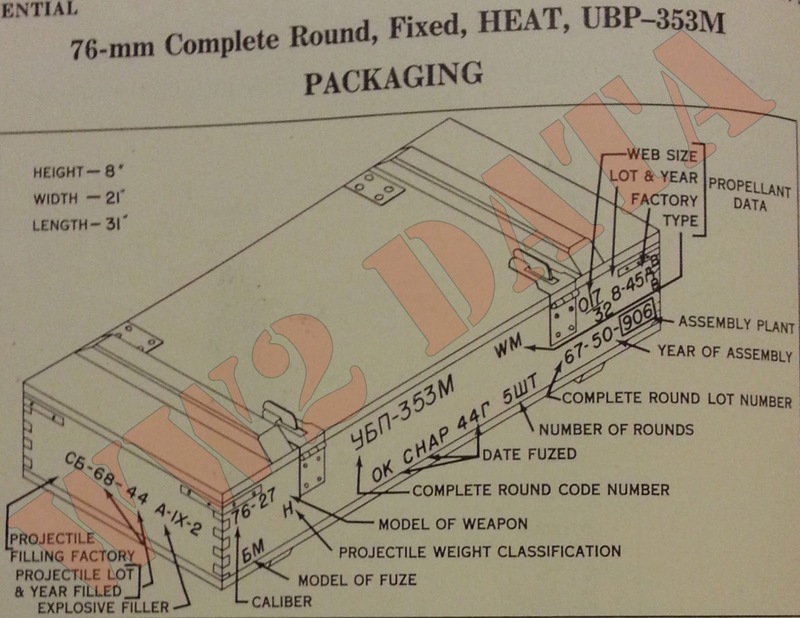 All complete rounds of the "353" series (that is, all rounds with the number "353" as a component of their code number) contains a reduced propellent charge. The cartridge cases of these rounds may be identified by a black band near the mouth. Some rounds have been found with two bands, as well as with no band, as shown above. The illustrated 5-round wooden packing box weighs approximately 58kg (128 lbs) when packed. 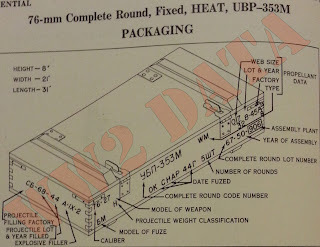 This ammunition may also be packed in a 6-round box weighing about 70kg (154 lbs), or in an 8-round box weighing about 94kg (207 lbs). 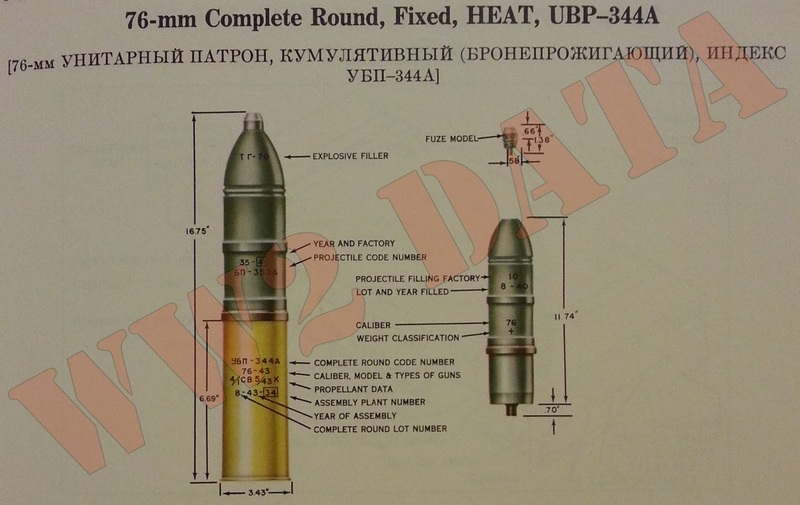 The BM fuze is used with the BP-350M projectile in this round. A tracer assembly is threaded into the base of the shell. This is unusual in a point-fuzed HEAT projectile. 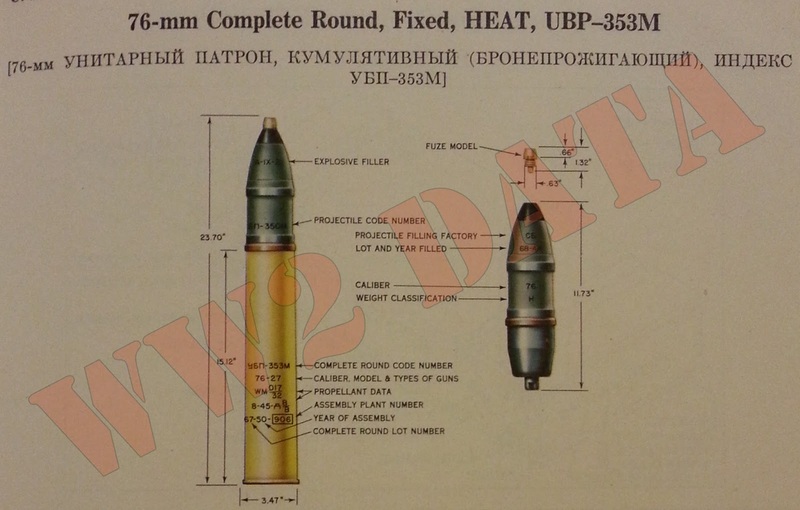 The complete round UBP-354A, with a BP-353A projectile and BM fuze, is a variant of the illustrated round. 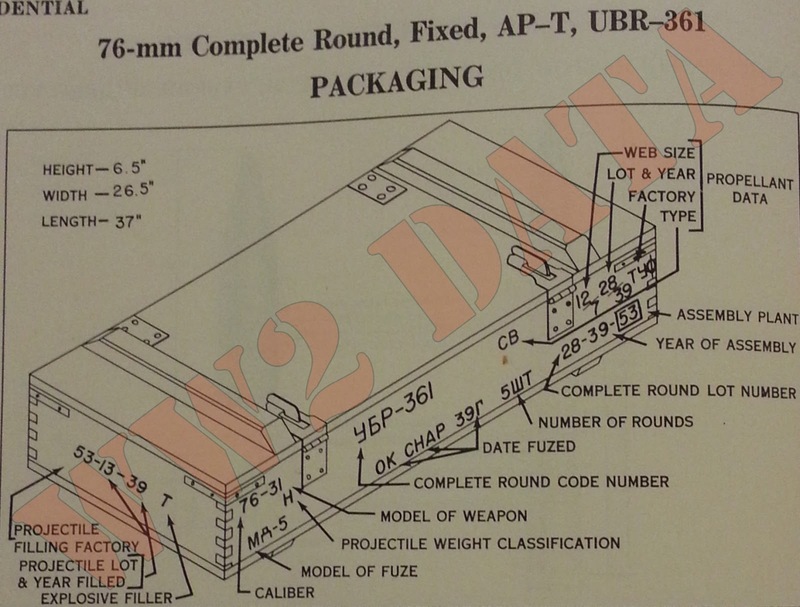 It is basically the same as the UBP-354M, and is fired from the same weapons. The illustrated 5-round wooden packing box weighs approximately 58kg (128 lbs). 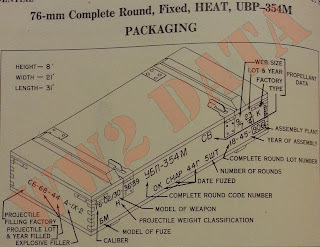 This ammunition may also be packed in a 6-round box weighing about 70kg (154 lbs), or in an 8-round box weighing about 94kg (207 lbs).